Here is a great write up from what looks like a really successful trip in the USA. Blake and Daniel got inspired and skated the miles. Skatefurther. 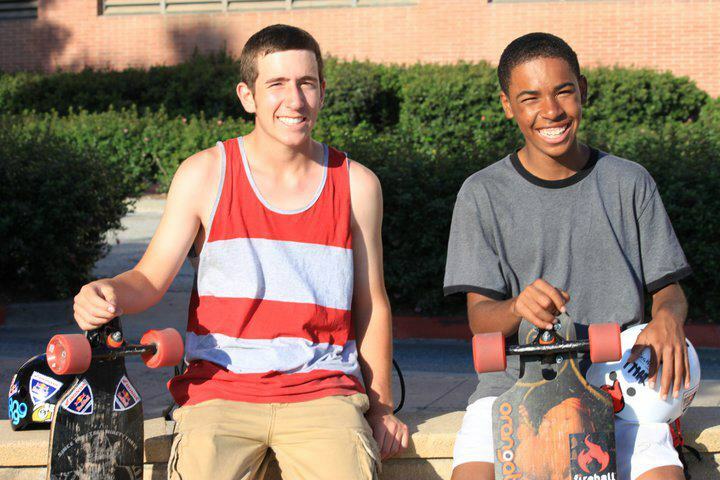 Talk to Daniel and I 10 months ago, and we’d tell you doing a long distance longboarding trip was just a dream. Doing something that would impact our community was something that we would have liked to do, but never really expected to follow through on. Watching the LongTreks episodes had us inspired, until we realized we are merely 15 and 16 years old, and still had things like school, sports, and our parents to worry about. Fast forward a couple months, and doing something for our community that no one else has, was all we could think about. With Autism being our main focus, we strived day in and day out to make the trip reality. We emailed every sponsorship company we could think of to get help, mapped every inch of the route from Stanford to UCLA, and spread the word to just about everyone we knew. Barely anyone believed that we could do it, but that gave us all the more reason to make it happen. Along with that, it meant a lot to us when sponsors such as Red Bull, Orangatang, Etnies, Vans, Concrete Wave, SilveRain Custom Longboads, Loaded, and ultimately Fireball wheels (the first company to sponsor us) offered their support, because it gave us the confidence to follow through on our dream. Both having autistic cousins, Daniel and I sat down and thought what charity we should promote throughout the trip. After putting some thought into it, we decided Easter Seals would be the best choice. Easter Seals is a non-profit organization that helps kids with autism and other disabilities “will have equal opportunity to live, learn, work and play in their communities.” This year, being the first year either one of us have done anything of influential significance, we wanted to spread autism awareness. Many people are not aware of how many children are being diagnosed with autism (1 in every 110 kids) and it’s a very life changing disability for the child and his or her family. As we plan more trips in the years to come, we plan on preparing for the trips better, and actually raising a good deal of money for Easter Seals. But, no matter what we do, we want people to know how important autism is to us, and how much we want to see it prevented/helped. Fast forward to now, and looking back on the trip’s success, all I can think about is doing another one. Daniel and I know our potential, and we know that we have many bigger and better trips ahead of us in the future. We want people to know that if you set goals for yourself, you too, can make a difference. If everyone had a mentality to make a difference in their community, the world would be a better place, and as the trips get bigger and better, so will the impact on our community, nation, and world. Wow! I’ve just been considering doing a 100 mile round trip longboard ride for an autism charity here in England! Had no idea someone had already done one…and made mine look kinda lame! ButI still think I’m gonna go for it. Inspiring stuff guys. I’ll be contacting you for advice. My plan is to start planning now, for a the ride in September 2012. Gotta get my route planned out, my gear organised and start looking for those all important sponsors. Planning on putting a video diary together of the planning and build up to the ride. Any suggestions or offers of advice please contact me (Chris Ward). I just ‘liked’ your facebook page. Next Next post: Event – Paul Kent takes 1st!